I work with many families through the support groups that I run and have heard varying feedback on the NDIS from great to horrible and everything in between. Obviously, there are disappointments and yes the NDIS does get it wrong, but I have found that the majority of people are able to do much more than they have ever been able to before this program. This was our case. My son Michael is 17 and what I hoped most for him was to be able to go out and enjoy life with his friends and it happened! He is a very busy kid and we now have the capacity, thanks to the NDIS, to have a support worker with him to access the community and for his personal care needs. To keep up with your NAPA home program, you can teach a support worker to do the exercises with your child. One of our support workers studied Sports Science, and loves helping Michael with his exercises. If you look into local programs you may also get the activity covered, such as karate, boxing, or dance classes. The regular exercise, no matter what form it comes in, is great for our kids. Being Agency/NDIS managed is very limiting, as they will only use NDIS registered providers. If you are Plan or Self-managed, you can source your own providers, agencies, and services allowing more flexibility. Be confident to shop around and get what is best for your child. It’s time to change our mindset; we have had to navigate what little services we have been able to obtain but now we have more choices and control. If you are not happy, let your service provider know and give them the chance to improve. If they don’t seek alternative providers, we have the choice to move and change. happy that we can facilitate that. We chose a specialist school where big groups of kids that are familiar with each other go out to do activities together. I for one want people to be involved in our lives that have a heart for my son and other children. If one support worker is away or sick, I know that I have others that can step into the role. It’s good to have a few different people on your roster. It also gives me the opportunity to use my current support workers to train any new people that we introduce. I don’t necessarily get people with all the qualifications, but I have discovered passion can outshine any resume. You would be surprised at the people in your circle who would love to help but don’t know where to start. Like a friend’s older teen who has a heart for your child. Being able to trust and know who works with your child is the ultimate goal. Don’t get caught up in other family’s negativity. The majority of the NDIS staff are there to help and are reasonable. Don’t compare plans, you don’t know what happens behind closed doors within other families. Remember your package can change every year with your child’s changing needs and this is a good thing! You may feel that you haven’t received enough in your package. If you need wheelchairs, reports, and modifications this can be true. But especially in your first year, it takes time to get the right providers, support services, and people working with your child. Many families don’t spend all the money in their plan because services took time to find or didn’t work out. Sometimes, they realized they didn’t need so much in a certain area and more funds needed to be dedicated to other areas. All of this is valuable information to take into your meeting for the next year. Let your NDIS planner know exactly what is needed and have the documentation to back it up. Michelle is a mother of two teenagers, Michael, who has CP and epilepsy, and Chloe, whose passion is riding horses. She has worked in the disability field in varying roles for the past 12 years. She has a passion to see children and youth with a disability reach their full potential and live the life they choose. She has recently started her own business, Living Life Support Services, who employ support workers to empower and enable young people to choose their own path. 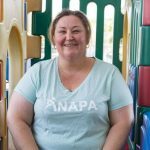 Her goal is to promote a change in attitudes to disability support – training Life Style assistants and not babysitters.